On July 7, 2017, the D.C. Circuit Court ruled on challenges to the Environmental Protection Agency’s regulatory definition of solid waste (DSW) as amended in 2015. Indiana adopted the DSW rule effective November 5, 2016. The current federal regulations remain in effect until the Court issues a final mandate. The court ruling does not impact Tradebe authorization to manage approved hazardous secondary materials (HSM) regulated under DSW. HSM is managed as a valued commodity and will be processed through one of Tradebe’s many recycling units designed for liquids or solids. Removal of the 2015 Verified Recycler Exclusion and replacement with the 2008 Transferred Based Exclusion. 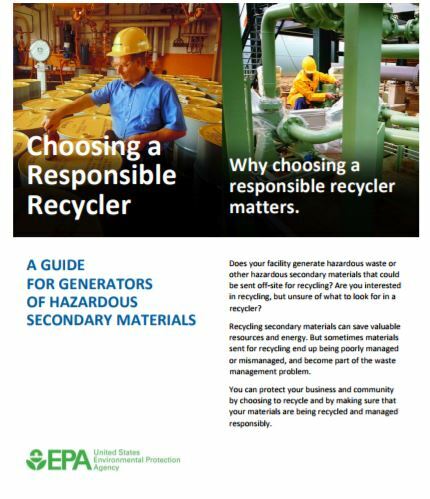 The difference in these two exclusions is that the Verified Recycler Exclusion required generators to send their hazardous secondary materials to Reclaimers who have a RCRA permit or RCRA variance issued by EPA. If States choose to adopt the 2008 Transfer-Based Exclusion: the Generator of a hazardous secondary material (HSM) could send the material to a Reclaimer of the generator’s choice; the Reclaimer is not required to have a RCRA Permit or a variance issued by USEPA. However, the generator has to make reasonable effort to ensure that the Reclaimer intends to properly and legitimately reclaim the hazardous secondary material and not discard it. It is important to recognize States are not required to adopt the 2008 DSW Rule, Many States may elect to adopt only specific sections of the rule or make their rules more stringent Furthermore, States will also have the option to adopt the 2015 Recycler language. Either ruling, the 2015 Verified Recycler or 2008 Transfer Based will allow Generator to continue to ship HSM to Tradebe, RCRA Part B Facility. 1. The hazardous secondary material must provide a useful contribution to the recycling process. 2. The recycling process must produce a valuable product or intermediate. 3. The persons controlling the secondary material must manage the hazardous secondary material as a valuable commodity. 4. The product of the recycling process must be comparable to a legitimate product or intermediate.